As I reflect on my life and the times that I have had real transformation away from old beliefs and lifestyle patterns and towards true healing, I realize that many times I have done so by following the path of the 12 Steps of AA. I grew up in an alcoholic home learning life patterns that kept the illness going on in my life as the codependent counterpart to the alcoholic. It was in my teens years that my alcoholic parent became sober and introduced me to AA, Al-Anon and Alateen. As I attended codependency recovery (Al-Anon and Alateen) and open AA meetings and worked through things with my parents, I became familiar with the 12 Steps. Still, it wasn’t until I was an adult living on my own that I found real value in them. I found myself trying to make everything behave and unconsciously following the dysfunctional rules of addiction. I was in a downward tailspin just like it is says in the first step, ‘We admitted…that our lives had become unmanageable. ’ I had to come to a place in my life that I felt completely out of control to start taking the 12 Steps seriously. It took some time to realize that the 12 Steps gave me a direction or path to follow to start a life that embraces transformation. It is the work of this process that brought me to the place of seeking connection with the ‘Power greater than I am’ whom I call ‘God, Spirit, Creator of the Universe, the Divine,‘ which in turn creates for me an openness to look for tools that assists me with this dialog. 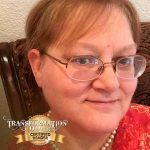 It was my desire to connect with Spirit and find insight to life’s challenges that brought me to researching and learning how to use Oracle cards. 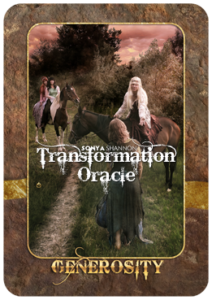 This led me to the Transformation Oracle by Sonya Shannon. 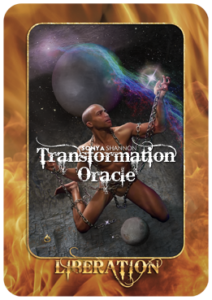 After taking a class with Sonya Shannon and learning more about how to use and understand the ‘Transformation Oracle’ I feel so much more connected to the ‘Transformation Oracle’ cards. I am amazed daily at how the ‘Transformation Oracle’ aides me in building a stronger relationship with God, myself, and others. 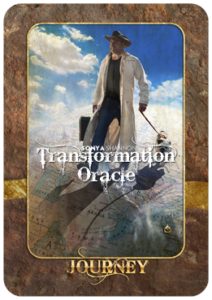 The ‘Transformation Oracle’ is able to assist in discovering blockages, giving insight and often times an ‘x-ray view’ of situations and/or present life challenges when working a program such as the 12 Steps of Addiction. Working a program such as the 12 Steps requires that you be honest with yourself and others about life’s past choices and aides in learning to live a life making better choices. 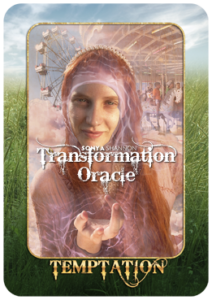 The ‘Transformation Oracle’ is a great tool to use to connect to Spirit to get guided information that will assist moving through the steps as well as insight in the daily walk of life. The key to the 12 Steps spread is to truly allow yourself to connect with each Step in a very heart felt place. A moment of concentration on the Step as it is read aloud with assist in the connection with God/Spirit to bring the confirmations and/or blockages to each Step forward in the reading of the ‘Transformation Oracle’ cards. Face up – Select, place and read card as drawn while still in the initial heartfelt connection with each Step. Face down – Select and place all cards then read the Step again for each card before turning face up for reading. Read the Step out loud. Let the Step settle in a heart felt connection for a moment. Draw the card for that Step. Lay the cards left to right 1-12 or if space is limited 1-6 and right below 7-12. Looking at the card – ask the following questions? a) What is the very first thought, feeling and/or impression when you see the card? b) How does this card relate to this Step for me? c) How does the element revealed give me insight? d) What is the descriptive word insight? e) What parts of the image sticks out to me as I view it? f) Is there any sacred geometry that gives a greater insight? 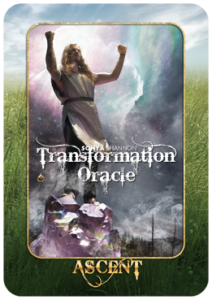 When you put this all together what is you thoughts on where you need to work with the Transformation Oracle on this step? Is there a practical application that you need to do to break through or move forward to the next step? Once all cards are read, what is the overall message, insight and or impression from this spread? Is there a practical application that you need to do to break through or move forward? STEP 1 ~ We admitted we were powerless over alcohol/codependency or (fill in the blank) that our lives had become unmanageable. The Journey card is number 1 in Earth cards with the phase of Beginning. As with any process there is a beginning and the Journey card signifies that choosing of our own free will to begin with Step 1. That there are life’s issues have become unmanageable and we are choosing to no longer allow it to live in this life’s path. The element is Earth signifies the materialistic, physical and monetary realms. Recognizing and choosing to admit that we are powerless is the first step. 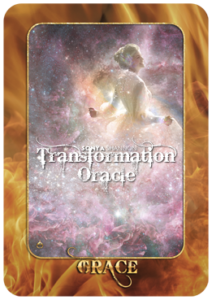 And by making the decision to take a chance and use the Transformation Oracle cards for revelation is a physical gesture to begin this process. The baggage, map and companion dog are the things that stick out the most in the image. Baggage – The image of the baggage gives a feeling as if it is demonstrating that all is prepared and ready to complete this process. That all that is needed is right here and there’s no need to be concerned if something is not in the bag. Map – The map represents that there is a direction and here’s the path to get from here to there. Assurance that on this journey we will not be or get lost. Companion Dog – Comfort. Will not be going through this alone. Drawing the Journey card just confirms that this the right path to learning what is needed to know working to overcome addiction. 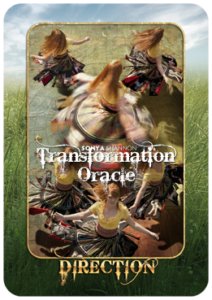 As directed from Spirit drawing this card first up just gives confirmation that the Transformation Oracle cards work well with the 12 Steps. STEP 2 ~ Came to believe that a Power greater than ourselves could restore us to sanity. The first thought that comes after seeing it is the Grace card is ‘Humility – a disposition to be humble; a lack of false pride.’ (1) Set aside the stinking thinking, the ego and prideful self to yield to an understanding that there is something or someone greater that will give insight to become a better or healthier person. The movement of the Fire element is up which is also is the direction which comes to mind when thinking of connecting with Spirit. “Fire is an active energetic element representing Spirit. Fire causes permanent change, especially related to old behavior patterns.” (2) Having a better understanding of the Fire element is just one more way that this card is pointing in the direction of hope of a brighter healthier future. Pulling the Grace card is all about reminding that receiving grace is a free gift. Grace is not something that is earned, it is something that given with out any reciprocation required. Given to us by Spirit and we extend it to others. 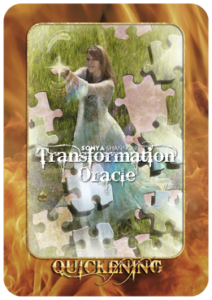 In the Grace card image there is a woman gliding across and sea of stars and it appears magical. She is so lovely in her pink crystal embossed gown. Spirit has clothed us with clothing of the stars and brilliant crystals as Grace covers us in love. A thought that comes to mind in this reading that this is a growing process that is not to be one that is a struggle and just to get through but one of gentleness and change. We don’t have to fight the process as long as we look within to stay on track and not let the ego/mind play games. STEP 3 ~ Made a decision to turn our will and our lives over to the care of God as we understood Him. The thoughts that come when first seeing the Quickening card and feeling the impact of the word is – divine connection. The divine spark that lives in all of us connecting with the greater one, Spirit (Fire element). Step 3 is an action step. The girl appears to be lifting the spark or light almost as an offering to Spirit which demonstrates a conscious effort of moving forward and committing to the relationship with Spirit, thus creating the divine spark connection to Spirit. Looking at the puzzle pieces feels like they represent parts of life that have been shattered from life’s challenges and injuries. As the work in partnership with Spirit begins and continues the pieces of life start to come together again. STEP 4 ~ Made a searching and fearless moral inventory of ourselves. What a great card for for Step 4! Create an searching and fearless inventory from several viewing angles. Not just the wrongs or injustices that have happened and/or were created but also the things of wonder and happiness too. Linking up with the element of Fire (Spirit) will bring clarity, love and assistance in viewing things differently. The Step 4 exercise is not about judging ourselves. It is a way to do some housekeeping, clear out cobwebs and spruce up the place so there is a clean healthier place to live inside and out. Only when actions, events and things from the past are brought into the divine light of Spirit can they be seen for what they really are. Blockages that have built up over time to wrench havoc in our lives and others. In Step 4 we boldly look at these with new insight then release them for a better life for all. How many ways are we lying to self? Why are we not being real with self about how we feel and think? Do we really have a right to be offended? Has there truly been an injustice or are we looking at this all wrong? Take off the mask and get real with where we are at. Take time to make the list. STEP 5 ~ Admitted to God, to ourselves and to another human being the exact nature of our wrongs. When thinking of Step 5 this statement comes to mind – ‘Families are as sick as their secrets’. Stuffing secrets becomes the way of life. If one of the family tells about life inside addiction there is a great price to pay which conditions most people to never tell any outsiders anything again. This is one of the rules of addiction that is very hard to break. So the very movement of expressing to another human being the nature of our wrongs takes a great deal of courage to follow through with Step 5. This maybe the fifth step but it is the first step to verbally expressing the nature of your inventory out loud. This card of Forgiveness with the naked lady is a reminder that through the process of Step 5 it will be necessary to give oneself forgiveness as you bare it all to God and another. The circle of the moon is a sacred shape which means wholeness. As we work through the inventory we are being restored to a whole self. No longer fragmented or held back by lies we tell ourself and others about our past. Now having been honest with Spirit, self and another, it becomes necessary to ready self to let go of the negative behaviors and thought processes that are truly unhealthy and no longer serve us. Looking at Step 6, we can really see it as a prelude to action of asking for this to be removed from our life. Having done the work of the inventory, really owned the good, the bad and the ugly and now we are at the place to really settle this in our mind and heart. To consciously let go of all that was not, or is not presently or will no longer be a benefit while walking out the rest of this life’s journey. The element here is Air which is mental/mind and as with any other new skill there is an adjustment time that comes with being willing to be accept that there were defects that have become bedfellows and now it is time to say good bye to those who are not serving the best interest of self and others. There is another paradigm the comes when working through Step 6, it is that being victorious over the negative interactions of the past which is shown here in this card as the man stands on mountain top with arms raised as if to say “I have made it! I am overcoming the past programming!” This card demonstrates that it takes work to get on top of the mountain of life’s experiences and to do so requires persistence but in doing so there is always help along the way from Spirit. 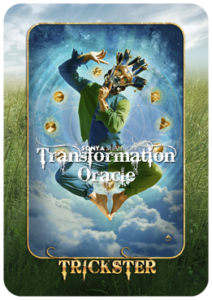 The phase of this card is Refinement, meaning that the purification continues with Step 6 as the mindset is set to move forward in a positive healthy way. Thoughts of how metal is melted and the impurities float to the top or burn off to make a quality product. This simulates the making a conscious decisions to engage a new thought processes as is guided by the presence greater than self throwing away the old stinking thinking and sometimes it feels as if we jumped from the frying pan into the fire. No more spinning around. Take a moment and get grounded. There is hope in the commitment of asking for removal of shortcomings. No more feeling like my life is constantly moving around in a circle. With the element of Air this is more about a change in how we think about ourselves and our internal dialog about the day. As we asked to have them removed there is still a process of retraining our mind to not play the guilt, shame and blame game as we go through out day. Humbly asking to have our shortcomings removed also means that they are gone. Not there to be picked up again. Not beating self up again and again, spinning around dizzy like a top. Make an honest effort to take the time for the Direction, instructions or guided impressions from the Spirit and become willing to try a new experience of slowing down, getting clear and being open to hearing what Spirit has to say. Completely different than being blow around and spinning in a circle from everything that comes along as if life is a pinball machine and we are the ball. STEP 8 ~ Made a list of persons we had harmed, and became willing to make amends to them all. The key to this step is to become willing to do the work. Here in Step 6 is another way to start learning a healthier decision process to live a life more successful overall. Step 8 is yet another layer of taking responsibility of past behaviors thus taking the inventory from Step 4 and now looking to put into action repairing relationships with people specifically that we have treated badly or harmed. This also opens us up to be much more benevolent and caring to self and others. ‘Generosity’ is a duality card of being a giver and/or a receiver. The question being looking at this card is; Are you the one offering or the one needing assistant or both? NO Judgements here, just dial inside and view it from your heart. As we back over our inventory list of those we have harmed may required us to see where we have also injured or harmed ourselves as well. Earth is the element here which is material, physical, money which is wonderful to have on Step 8. Much of the time when living in addiction we have monetary issues, loss of relationships because of monetary abuse and our living environment may have been in a state of poverty because of it. Now the 12 Steps is offering you a path to follow to restoration of sanity and a healthier life style. As we work work Step 8, we are not just working towards restoring ourselves, we are also working on restoring others along the way. STEP 9 ~ Made direct amends to such people wherever possible, except when to do so would injure them or others. The Temptation here is to not be just throwing up all over people to make myself feel better or just the get through the process of the Step 9 to be able to say I did it. It is very important that we earnestly take direction from the Spirit as to when the time is right to make amends. Air is the element here and it is about using our mind to make thoughtful caring decisions about timing and tone we use when are in the actual moment. This process of making amends is about also doing it with a heartfelt response as to restore the relationship if possible. The phase of this card is Beginning, so as relationships are restored they begin again. It is a forward movement. We also need to be aware that there will be some that will never have an appropriate time and we need to not get hung up on it. Temptation often masks itself as being something that it is not in the mind. Making amends can easily trigger the need to be vindicated or another issue that has nothing to do with this particular person/event and its very important to slow down and truly think it through. We are not responsible for the other person’s response just our own, but if we get triggered it could complicate things more which would just add to the list of person’s injured. Be open to the hope of opportunities that lead to restoration along the journey and offer light and love to the rest. Always think for the good and benefit of all. STEP 10 ~ Continued to take personal inventory and when we were wrong promptly admitted it. Breaking the chains of addiction, learned lifestyle choices and behaviors doesn’t happen over night. The physical chains may be removed but the mind and soul are often still bound. Here in Step 10, Liberation is presented as an ongoing process to stay in touch with Spirit’s divine light as well as continually take personal inventory and quickly take responsibility for things that happen along life’s journey. The circle shape of the planet in the background is also a sign of wholeness. Working Step 10 daily brings a directive of how to achieved restoration back wholeness to life as never known before thus bringing a strong sense of Liberation from addiction. STEP 11 ~ Sought through prayer and meditation to improve our conscious contact with God as we understood Him, praying only for knowledge of His will for us and the power to carry that out. First thought, don’t be so serious in the endeavor of seeking God and the knowledge to a better life. Learn how to play and not be so serious. Lighten up enjoy the moment. Be free to recognize that not all failures or loses are for your demise, they can be seen as dark clouds with a silver lining. Feel the joy and accept self at whatever stage of life is present moment because God accepts us as is. Air is the element of mind and the mind does like to play tricks on us with its negative self talk however as we continue the work in Step 11 and as we connect with God for knowledge our thinking processes are changing those old patterns and actually changing our physical brain connections as well to live healthier lives. The Trickster here is juggling the sacred geometric building blocks of life meaning we have all we need to do the work and communicate with God to live a life free of addiction and stinking thinking. In addiction there are so many unwritten rules that everyone in addiction live by and here in Step 11 we are giving all the necessary tools to be set free to build a better life for self and those we share life with. Trickster is not a fool, he just looks at life from a different paradigm. The phase of Beginning is again a offering to kick start life in a different direction. Trickster is inviting us to make a paradigm shift for addiction to wholeness and self love. STEP 12 ~ Having had a spiritual awakening as the result of these steps, we tried to carry this message to alcoholics and to practice these principles in all our affairs. Another wonderful confirming message for Step 12. Leaving or Separation from the past brings me to a new place to start a new path on rather journey called ‘life’. And in this new place we are meeting lots of new people. Some are in need of process of the whole 12 Steps. 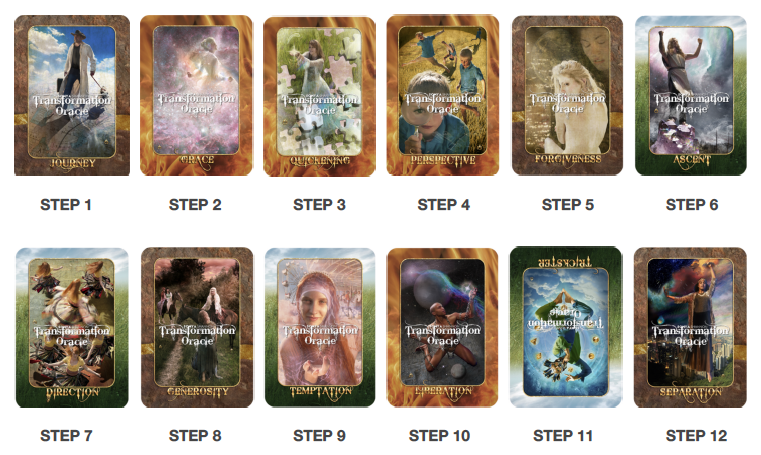 Some are in need to look at the 12 Steps with the assistance of the Transformation Oracle to discover some blind spots, receive direction or maybe even a confirmation that they are on the right track. Step 12 is about being a person who is here to help which may become a passion and often that requires Separation from others who continually want to monopolize your time, resources or just be rescued with no real effort to change. The phase here is Ending which is also a form of Separation. The Separation card’s element is Earth relating to material, physical and monetary. So with the phase of Ending and the element of Earth, Separation from addiction sometimes requires a change in associations and celebrations. This can be hard to discern in the beginning but with the direction from Spirit knowledge will come. Looking at life through new eyes with that knowledge of who to help, where to make new associations and learning new ways to celebrate will soon come with ease. Changes that last a lifetime is very difficult and challenging work. Finding ways to assist one in understanding their personal journey is of great value. 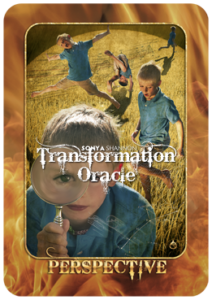 It is easy to see the value in how the ‘Transformation Oracle’ brings knowledge and insight to the light when used working with 12 Steps. 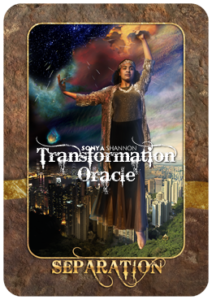 Chose to be inspired and encouraged as you discover for yourself the wonder and wisdom from Spirit though the ‘Transformation Oracle’. For basics, check out how to do the Element Balancing Spread and get answers to questions using the Yes, No, Maybe Spread. Create your own spread following the guidelines in Adryanna Kenna Sadge’s article on How to Design a Spread Using Intuition.